Have you ever thought what goes on in the minds of people who market toilet paper or office supplies? It’s not that hard to think of ways to market beer, chocolate or smartphones; but some products are so ordinary and prosaic, that one has to wonder how a certain brand marketing them stands out from the competition. Indeed, in many cases ads for these products are dull and lack any creativity; the only reason a certain brand may succeed is that the store down the street just happens to sell that specific brand. And yet, some brands that market boring products somehow manage to create awesome, inspiring campaigns using social media, content marketing, paid ads, etc. In this post I’ll discuss three such brands whose campaigns breathe magic into the most humdrum products. Blendtec is a company that manufactures blenders (shocking, I know). How creative can you get marketing a product the sole function of which is to blend stuff? Well, turns out that things can get very creative when one tries to blend objects which are not food. A decade ago, Blendtec started its viral YouTube series, Will It Blend?, and the rest is history. In each video, Blendtec CEO Tom Dickson tries putting different objects into a Blendtec blender to see if they will blend. So far, objects that have had the misfortune to be part of the project include an iPad, golf balls, a plastic human skeleton, an Apple Watch, super glue, a Rubik’s Cube, a 3310 Nokia mobile phone and a Justin Bieber doll. The videos have a nostalgic 1970s look and feel to them (in one of my recent posts I’ve discussed the power of nostalgia in marketing) and each video ends with a twist. Will It Blend? also has its own website, where one can watch all the videos. And what happened to the Justin Bieber doll? Each video in the series gets millions of views. As of September 2015, the videos reached a total of 265 million views on YouTube. Since the campaign began, Tom Dickson has made numerous appearances on leading TV networks such as NBC, CBS, The Discovery Channel and Fox. The campaign has been mentioned on the radio and in various magazines (The Wall Street Journal, Businessweek and The Scientific American, just to name a few). Blendtec has been invited to collaborate with companies like Nike, Google, AT&T and Novell. The Will It Blend? series is not only popular but also critically acclaimed: in 2007 it was nominated for the YouTube Award for Best Series; and that same year it was awarded with the title .Net Magazine’s Viral Video campaign of the year. In 2008, it won the Bronze level Clio Award for Viral Video. But most importantly, Blendtec’s sales have gone up a whopping 700 percent as a result of the campaign. The series is still going strong, with viewers now requesting Blendtec to blend specific objects. Blendtec has thus unlocked a very coveted achievement for brands: it created engagement. When we think of ads for toilet paper, what usually comes to mind is fluffy puppies running around the house and playing with toilet paper rolls. With so many toilet paper brands and memorable puppy ads, the Charmin brand had to think outside the box. Toilet humor has never been considered an option by other brands, since these kinds of jokes are usually in bad taste. 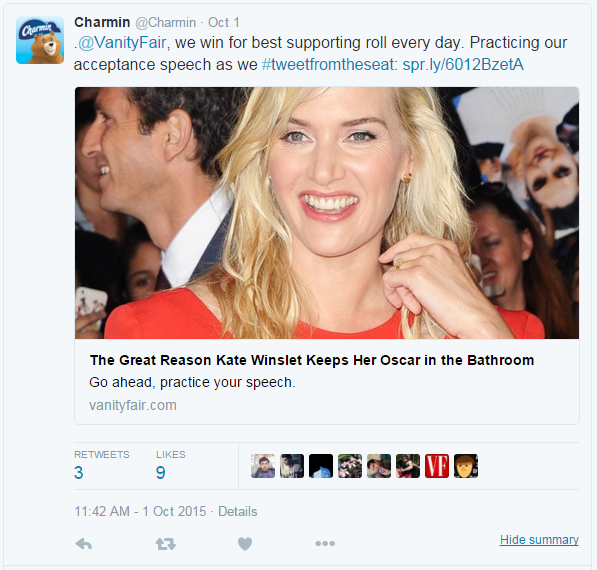 But then Charmin did it – and it somehow managed to do it right. Charmin decided to connect with its audience on social media, and it now has a Facebook page with over 1 million followers, a Twitter account boasting nearly 70,000 followers and a popular YouTube channel where many of the videos get hundreds of thousands (sometimes even millions) of views. Charmin’s style is certainly charming: it’s positive, endearing, on point with the latest trends and most importantly – it doesn’t take itself seriously. As a result of Charmin’s approach to marketing, no one can see Charmin toilet paper on the shelf at the store and not think of their quirky ads and videos. So what’s their secret? 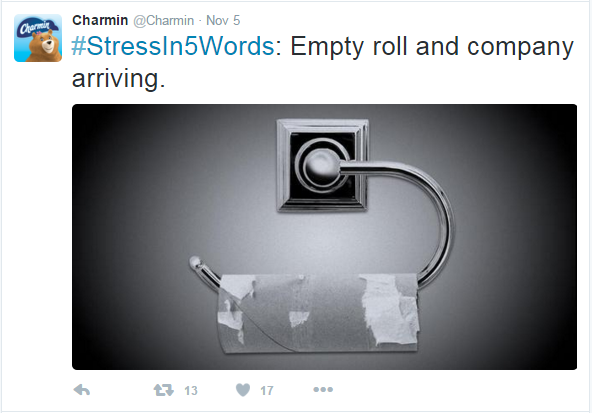 Charmin’s social media team explains that to them, Charmin is not about toilet paper: it’s about the human experience in toilets. They feel that the brand’s most important asset is its authenticity – not trying to be something that it’s not. They provide two more tips for marketers: one, it’s very important to understand the nuances of the different social platforms and of the community that forms around the brand. Two, the more the lines between traditional marketing, digital marketing and social media marketing blur, it’s vital to embrace a holistic marketing approach that will touch the hearts and minds of the clients. Staples is an American chain selling office supplies. While we’ve seen how such companies can inspire cult TV shows like “The Office”, marketing office supplies in real life seems more challenging. But like Charmin, Staples doesn’t focus on its products – instead, it focuses on day-to-day office experiences everyone can relate to. 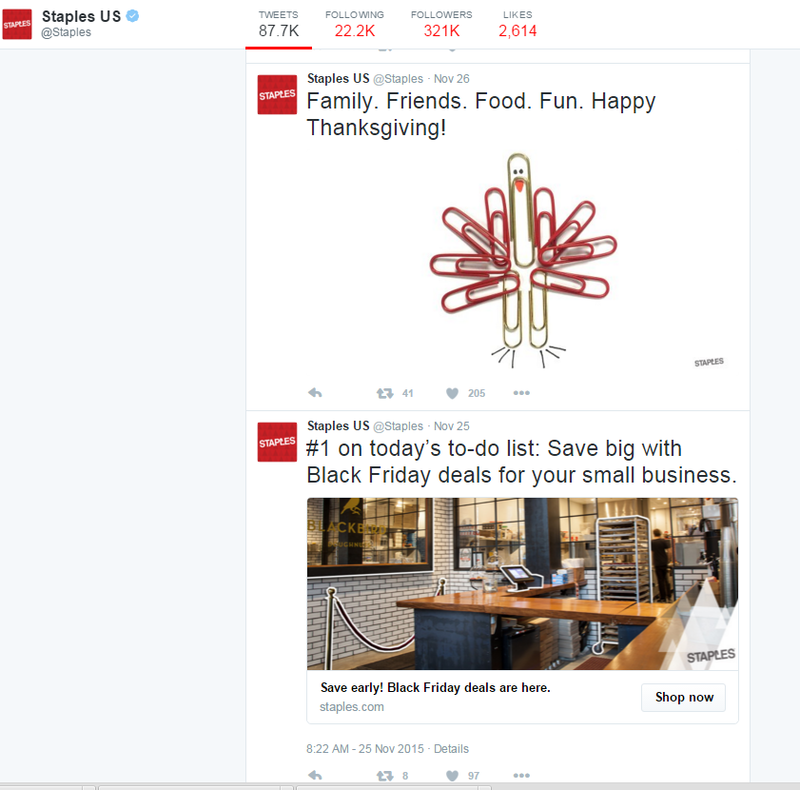 Staples does this using Facebook (where it has nearly 1.5 million followers), Twitter (322,000 followers), Instagram (21,200 followers), LinkedIn (22,500 followers), Google Plus (16,600 followers) and YouTube (11,600 followers). Judging from its numbers of followers, it does so quite successfully. So what is going on in all its social media channels? 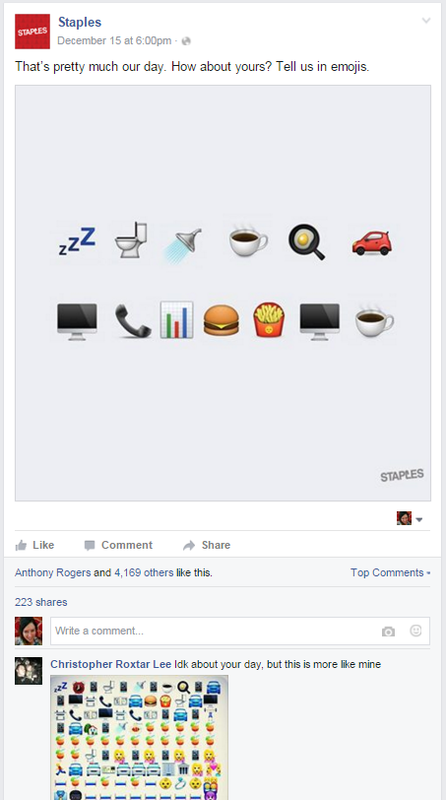 But Staples’ marketing outlets which stand out the most are definitely its Facebook and Twitter accounts, where you can find a great blend of funny, creative and touching posts. The bottom line is that Staples knows its audience well. 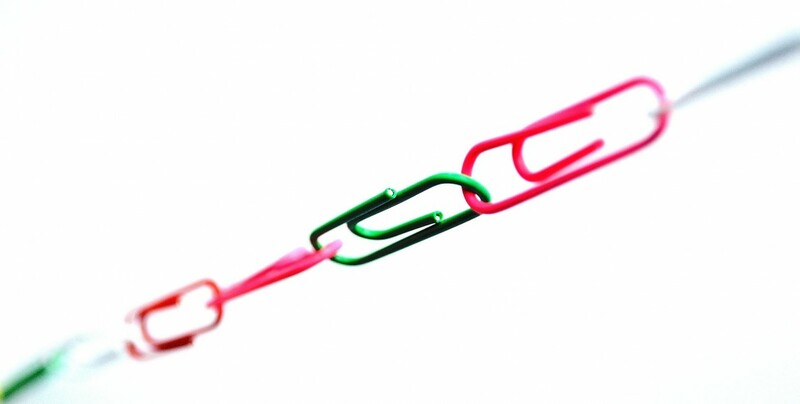 While the brand mainly targets office employees and business owners, it also takes care to reach other people who need office supplies, such as students or people moving house. Their posts are well-balanced – some are meant to create engagement, others have strong CTAs and some are both. 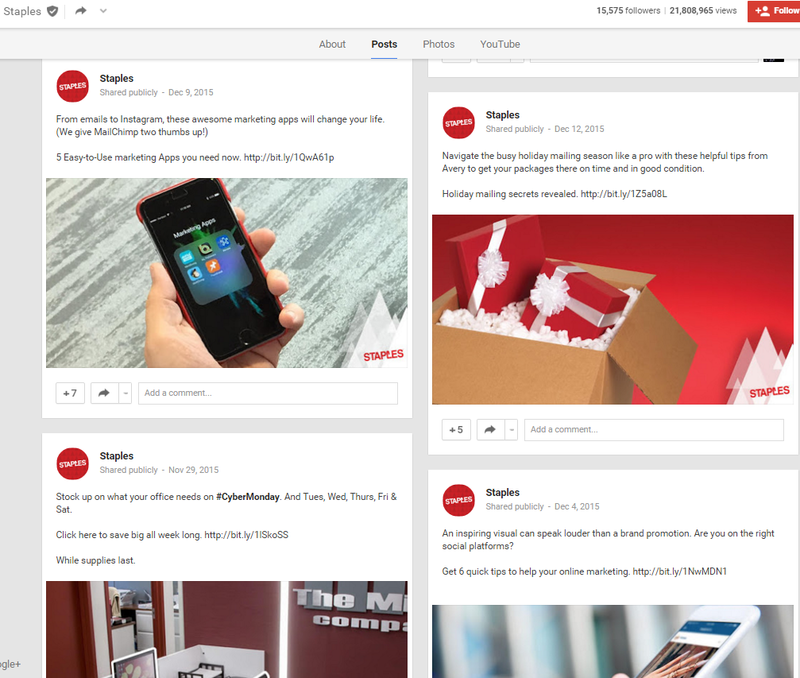 On each platform, Staples address their followers in a light, friendly and often humoristic manner, which prompts them to like, comment and share. Each of the marketing platforms is used wisely, and the posts are are appropriate for the platform they’re on. Even the most boring product can be made exciting or funny, if you market it creatively and authentically by thinking about the situations associated with it. Have you encountered other instances of boring products being marketed superbly? Share your examples with us in the comments section!